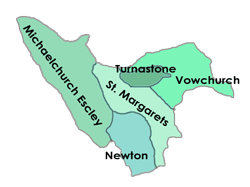 Michaelchurch Escley, Newton, St. Margaret’s, Turnastone & Vowchurch. Our parishes lie in the Golden Valley and in the foothills of the Black Mountains in Herefordshire. The Escley Brook and the River Dore run through our parishes to the west and east respectively. The land to the west rises in a series of ridges and valleys towards the Black Mountains, whilst in the east the land is flatter before rising again on the east side of the Golden Valley. The whole is characterised by great natural beauty. The city of Hereford lies about 10 miles due east, whilst the Welsh border town of Hay-on-Wye lies a similar distance to the north-west. Our parishes are served by the Vowchurch & District Group Parish Council. B4348 speed limit – We hope there will be a 40mph speed limit introduced in the next year to eighteen months on the B4348 through Vowchurch and also through Turnastone and Vowchurch villages. This follows concerns expressed by many over the years about the junction with the B4348. See a fuller report under the ‘Parish Plan’ section. The Parish Council has a vacancy for a Parish Councillor to represent Newton. If you own property, rent or work within 3 miles of the parish and are interested in joining the Parish Council or would like further information please contact the Clerk. The Lengthsman contract will be due for renewal at the end of March and the Parish Council would welcome tenders for 2019/20. General maintenance days are currently 1 per calendar month betwen April and September increasing to 2 days per month over the winter period. There would also be nominated tasks as requested by the Parish Council. if you would like further information or would like to tender please do so via the Clerk at parishclerk@vowchurch-gpc.org.uk.